Jasiri X is a hip hop artist from Pittsburgh who raps the news over some dope beats produced by The Grand Architect Paradise Gray of X Clan. The two release these tracks as videos on youtube.com in a series titled “This Week with Jasiri X.” Jasiri X is popular in activist circles, frequently performing at benefits and rallies. We’ve been bobbing our heads to X’s tracks since the release of OG3 – Oscar Grant Tribute in January 2009, but in light of his most recent release, American Workers vs. Multi-Billionaires, we decided to take a closer look. OG3 tells the story of the murder of Oscar Grant and the rebellions following his murder, from the points of view of Oscar Grant and the protesters. Although the facts aren’t 100% correct in OG3, it is a good example of the many tracks Jasiri X has released about police brutality and aggression against Black people in Amerika. A track titled Free the Jena 6 was one of the first that got peoples’ attention, and he continues to shout out victims of police execution and violence by name. When working on an international piece, Jasiri X correctly draws connections between police brutality here and imperial aggression against Third World peoples around the world. He recently released a track about the uprisings in Egypt with M-1 of Dead Prez, titled We All Shall Be Free! 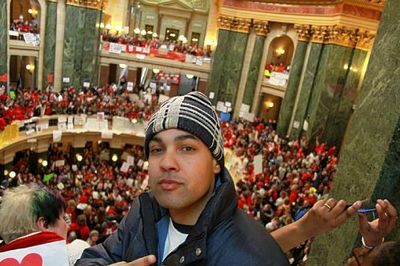 Despite his revolutionary lean, Jasiri X still holds on to his Amerikanism on several issues, which comes up big time in American Workers vs. Multi-Billionaires. The video for this song was shot inside the capitol building in Madison, Wisconsin, against a backdrop of labor aristocrats raising a stink to keep their “fair share” of the imperialist pie. The title implies that a line is being drawn between Amerikan “workers” and the capitalist multi-billionaires with this union busting legislation. However, as outlined in several articles and books(1) Amerikan “workers” are actually fundamentally allied with the imperialist, capitalist class on an international level. It is only because of the pillage of resources and lives in the Third World that the government employees in Wisconsin even have health care in the first place. Defending this “right” to health care is essentially the same thing as supporting Amerikan wars, which Jasiri X says he is against. History has shown that the multi-billionaires won’t give up theirs without a fight. “When did the American worker become the enemy? The Amerikan “worker,” or labor aristocrat, is the enemy of the majority of the world’s people because their lives are subsidized by the economic exploitation of the Third World. Third World peoples’ sweat, blood, and lives are wasted to pay for the Amerikan “worker’s” pensions and health care. This is because most of the “work” that Amerikans do does not generate value; we have a service-based economy. The only reason our society has such a disproportionately high “living wage” (as if those who make less die) is because we are comfortable swinging our weight around in imperialist wars of aggression to extract wealth from the Third World. Jasiri X seems to be opposed to this extraction of wealth, but does not make the connection that Amerikan “workers” are directly benefiting from it, and not just the multi-billionaires. Jasiri X seems to adhere to an anti-racist model of social change. Besides being supported by an incorrect analysis of history, it also has him defending Obama as a Black man, rather than attacking him as the chosen leader of the largest and most aggressive imperialist country in the world. Jasiri X correctly pins Obama as an ally of the Amerikan people; their key to a comfortable lifestyle and fat retirement plan. But as an ally of the oppressed, Jasiri X should accept that Obama, and the labor aristocracy, are enemies of the majority of the world’s people, and leave patriotism behind. Agitating for the betterment of people in Haiti, Palestine, Egypt, Iraq, etc. as Jasiri X does through some of his raps, while at the same time defending Obama and the Amerikan “worker,” is a recipe for stagnation. If we want to end oppression the world over, we need to have a clear idea of who are our friends and who are our enemies.